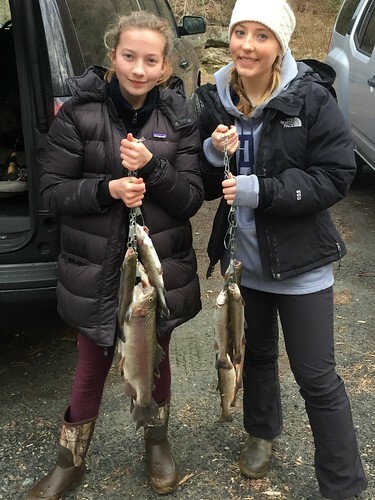 Put-and-take trout fishermen had a successful opening day of the 2019 trout season. Beautiful weather prevailed, the trout hatchery program provided generous stocking of healthy trout and a great time was had by all! Fishing for a variety of catfish species is very good right now. Channel catfish are spread throughout the upper Chesapeake Bay and most all of the tidal rivers flowing into the bay. Blue catfish can be found in the Potomac River from the St. Georges Island area north to the Wilson Bridge. They can also be found in the Patuxent and Nanticoke rivers and are starting to show up in the Choptank River. Flathead catfish can be caught in the Conowingo Dam pool and the lower Susquehanna River. Fresh cut bait is standard fare for successful fishing for catfish. Except for the rain this Friday, the upcoming week is setting up for some nice fishing conditions. Normal flows and clearer waters on all Maryland rivers, combined with a nice stretch of weather, will warm the bay and all our favorite fishing waters. Expect windy conditions on Wednesday with a chance of rain Friday and early next week. 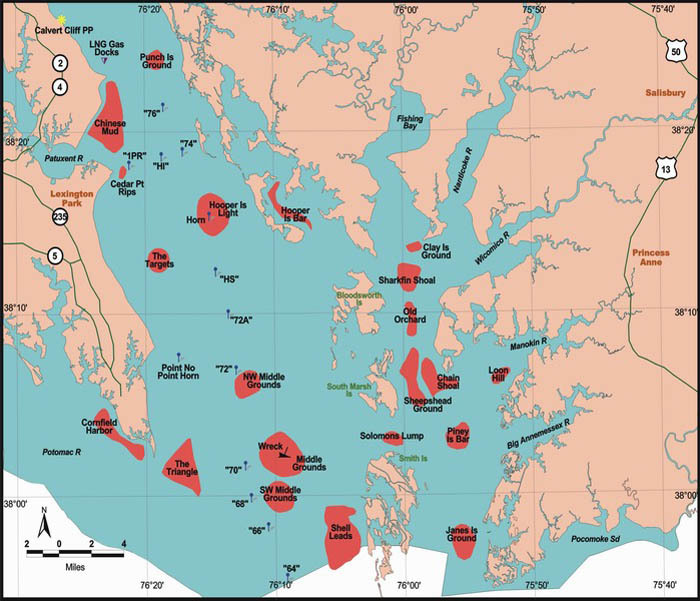 While the Maryland portion of the bay continues to have suitable oxygen conditions from surface to bottom, this pattern will change soon due to warming waters. Bay salinities are still below average from the continued above-average rainfall. Recent bay monitoring is showing surface water temperatures are holding right around 50 degrees, with some tributaries slightly warmer. 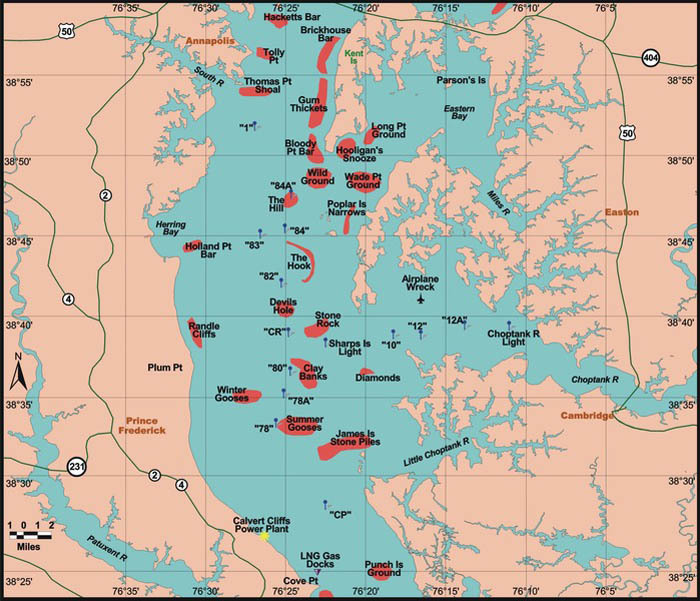 Upper bay water temperatures, such as at Tolchester and the Inner Harbor, are in the upper 40s, as are Middle Bay water temperatures at Thomas Point. 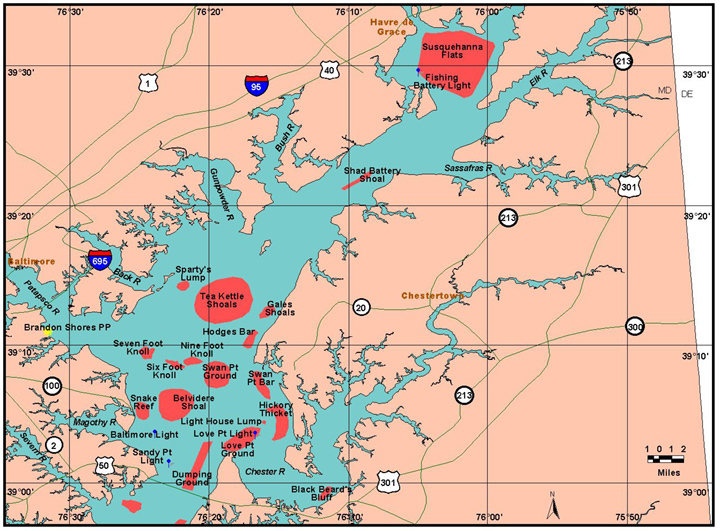 Lower Bay water temperatures are holding around 50 degrees at the Potomac buoy, Little Falls, Bishops Head, Cambridge and Harris Creek. Shallow dark-bottomed rivers and streams and downwind areas will warm faster and will often hold water temperatures from the low to mid 50s. Surface waters are now warmer than most bottom waters. Depending on the amount of rain we receive on Friday, expect improving water clarity conditions on the Potomac River below Little Falls for the shad run. However, turbid conditions are still present below Quantico to Colonial Beach. In the upper bay, water clarity is improving while turbid conditions are still present from the Gunpowder down near the Bay Bridge. Expect normal flows for the Susquehanna, Potomac and smaller rivers and streams entering Maryland’s portion of the bay. There will be above average tidal currents conditions all week as a result of the new moon April 5. The lower Susquehanna River and Flats are beginning to warm up and water clarity has greatly improved. Currently there are no gates open at the Conowingo Dam and power generation is at a minimum. Water temperatures are in the upper 40s in the river and low to mid-50s in the Flats. White perch are beginning to make their way into the lower Susquehanna and male striped bass have arrived. The larger female striped bass will begin to arrive in the next week or so. White perch are still being caught in many of the tributaries to the upper bay region but the peak of the spawning runs are behind us. Targeting post-spawn white perch with jigs or bottom rigs tipped with pieces of bloodworm or grass shrimp is a good way to catch them. Those using small minnows for white perch are also catching post-spawn yellow perch. Channel catfish, crappie and chain pickerel along with a few blue catfish are available in most of the tidal rivers. The lower Bush, Chester, Magothy, Middle, Northeast, Sassafras and Susquehanna rivers are all good places to fish. The white and yellow perch will most likely be found in regions below the spawning areas as post spawn fish drift down river. Shore-bound anglers are beginning to show up at Sandy Point State Park at the point called the rips, bottom fishing with heavy surf gear. This catch-and-release fishery is dominated by casting out bottom rigs baited with bloodworms or cut bait. Care must be taken with fish to be released in the water; heavy tackle is needed along with knee boots to keep fish from being damaged in the dry beach sand. Water temperature is about 49 degrees and slowly rising. There is a limited amount of catch-and-release action for medium-sized striped bass along channel edges near the mouths of some of the major tidal rivers and out in the bay. Most are spotting suspended fish with their depth finders and then jigging with large-skirted soft plastic jigs. The Bay Bridge piers have also been holding striped bass. A few boats have been out trolling the main channel edges of the bay looking for some catch-and-release action with large pre spawn striped bass but so far the pickings have been slim. There has been some action for those jigging at the Calvert Cliffs Power Plant warm water discharge this week. A mix of post-spawn white and yellow perch are still being caught in the upper sections of the major tidal rivers in the region. 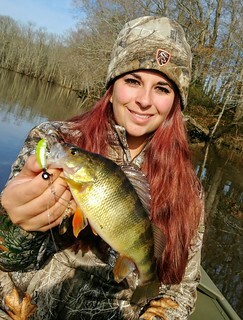 Both species of perch have moved downriver from the spawning areas and can be caught in a variety of methods. Bottom rigs or jigs tipped with pieces of bloodworm or grass shrimp work well when fishing close to the bottom in the deeper areas. Fishing with small beetle spins or minnows is also a good way to target larger white perch, and perhaps the best way to catch yellow perch. Crappie, chain pickerel and channel catfish can also be part of the mix. 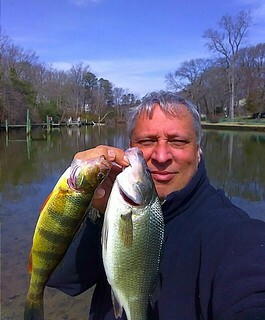 Hickory shad are moving up the Choptank and Tuckahoe rivers and a few have already been caught in the spawning areas. The Red Bridges area on the Choptank and the Crouse Mill Dam are the end of the road for these spawning fish. This is a fun catch-and-release fishery and they give a great fight on light tackle. Small colorful shad darts and small gold spoons are favorite lures to use. Catch-and-release trolling for large pre-spawn striped bass is gaining momentum as warm weather and calmer winds move into the region. Trolling along the steep channel edges of the lower bay region with large parachutes and bucktails off planer boards and heavy inline weights are good fishing methods. Medium-sized striped bass are being found along channel edges in the lower Potomac River around St. Georges Island and Piney Point, and jigging with large soft plastic jigs has been the most popular way to fish for them. There continues to be good fishing for post-spawn white and yellow perch in the upper reaches of the tidal rivers and creeks. Now that the perch are moving downriver from the spawning areas, targeting deeper holes has been a good tactic. To catch them, Cast small jigs tipped with small plastic grub bodies or jig heads tipped with grass shrimp, pieces of bloodworm or small minnows across current, and jig along the bottom as the jig and line sweep downstream. Bottom rigs baited with pieces of bloodworms, grass shrimp or small minnows also work well. The Nanticoke, Patuxent and Potomac rivers are all good places to fish. Fishing for northern snakeheads in the creeks of the tidal Nanticoke, Patuxent, Potomac and tidal areas of Dorchester County has been reaching a feverish pitch for anglers looking for some fun action and tasty fish fillets. The snakeheads are being caught by fishing large mummichog minnows about one foot under a bobber. 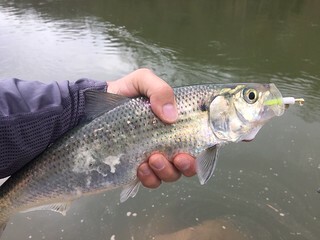 The Hickory shad catch-and-release fishery in the tidal Potomac near the Chain Bridge in the District of Columbia is in full swing this week. Anglers from shore or small boats are enjoying excellent fishing by casting shad darts and small gold spoons. The occasional American shad can be caught at times and those fishing fresh cut baits on the bottom can catch blue catfish. Blue catfish can also be caught in the Nanticoke River near Sharptown and the mouth of Marshyhope Creek. Put-and-take trout fishermen could hardly have picked nicer weather for the traditional opening day of Maryland’s trout season. Some of the more popular locations tended to be a bit crowded but everyone found a piece of water to fish. The generous stockings made sure everyone had a great time and the trophy-sized trout that exceeded 5 pounds or more were stocked at every location, bringing whoops and big smiles to the lucky ones that landed them. More stockings are occurring each week and the hatcheries have plenty of beautiful trout coming to a fishing hole near you. Stocking is announced through our email subscription service or by checking the trout stocking website. There are many trout management waters that are not designated as put-and-take and are managed as delayed harvest, catch-and-release or fly-fishing only. These management areas give anglers the opportunity to enjoy catching trout and some elbow room in a classic trout fishing atmosphere. 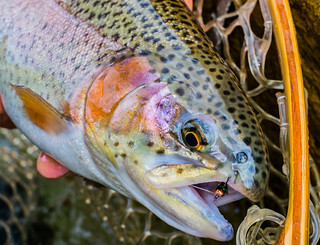 Drifting nymphs or working small streamer flies is a fun way to fish for trout; these special areas provide plenty of opportunity. Warming water temperatures in the freshwater ponds, lakes and rivers have many species of fish becoming more active. At Deep Creek Lake, walleye and yellow perch are being caught along the steeper edges of the lake by drifting minnows. Walleye are also being caught in the evening hours by casting small crankbaits or jerkbaits in these same areas. The upper Potomac River is providing good fishing for walleye, and smallmouth bass are now becoming more active. Fishing with small crankbaits or jigs are good lures to use for both. Fishing with live minnows is also a proven tactic in some of the calmer eddies and pools. 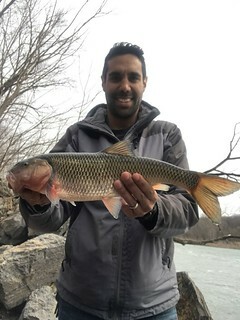 Adam Aghion was fishing minnows in the upper Potomac recently for walleyes when he made an unexpected catch — a 2.07-pound fallfish, which is related to chubs and carp and found in many of Maryland’s streams and rivers. The Maryland Department of Natural Resources decided to open up a category for this species and has now recognized Adam’s fish as a state record. Largemouth bass are gearing up for the spawning season later on this month and into May. They are aggressively feeding on basically anything that moves. Crawfish are moving from their winter haunts in the deepest waters to emerging grass beds in warmer and shallower waters. Small crankbaits, jigs and soft plastic craws are great choices to work in the transition areas between the deeper waters and the shallows. Spinnerbaits are a good choice to cover a lot of water and a good imitation of small baitfish. Fishing for crappie continues to be excellent around structure in deeper waters. Fallen treetops, marina docks, bridge piers and sunken wood are all good places to try small jigs or minnows under a bobber. Anglers are beginning to get excited about who will have the honor of catching the first flounder in the Ocean City area. It may happen this weekend, as water temperatures in the back bay areas are in the low 50s. A few flounder have been reported south at Wachapreague Inlet. There continues to be some striped bass being caught and released in the back bays, mostly near the Route 90 Bridge and the inlet. Offshore, everyone is focused on tautog fishing at the offshore wreck and reef sites. Fluctuating water temperatures have caused up-and-down fishing success, often from one site to the next based on currents. When conditions are right, some very nice tautog are being caught. Jonah and green crabs tend to be the preferred baits. This report is now available on your Amazon Echo device — just ask Alexa to “open Maryland Fishing Report.” And our Alexa skill is nominated for a national award — cast your vote to help Maryland reel in this prestigious honor!